Summer is the time for barbecue and grill. While Finns love their sausage (and the amount we ate last year was highest ever) I prefer meat and vegetables over the traditional sausage and mustard. 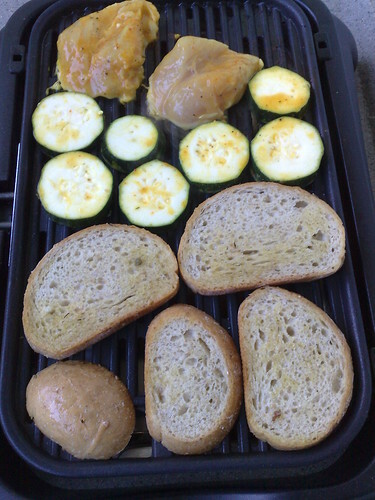 My BBQ usually includes chicken, marinated courgette (aka zucchini), corn on the cob, bread and mushrooms. There’s no magic in preparing chicken, courgette or bread, and even less the corn, but mushrooms are the most posh and work-intensive part of this summer dinner. It all starts in the grocery store, as usual. 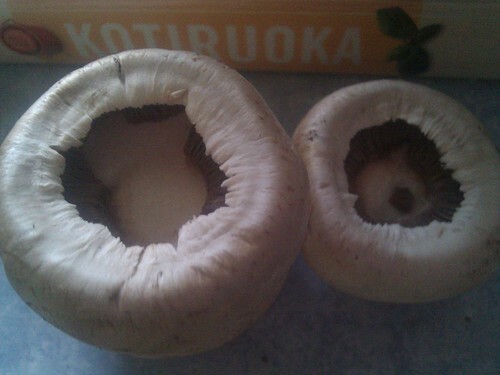 In Finland I never buy my mushrooms bulk, but always, always pick the best and biggest ones from the box, individually. 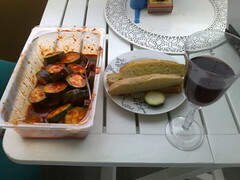 I don’t mind them being open a bit, atleast for this dish, since it doesn’t really matter in the end. The biggest mushrooms found here are about the size of a smallish clementine, and portobello’s aren’t ever sold in the local supermarket – but the normal “jumbo” (sic) ones are perfect for this use. There’s going to be four of us for the BBQ tomorrow, so I picked 10 mushrooms, two each and two extra ones. Finns are always proud of their selection of cheeses. While we and the Scandinavians love mild soft cheeses and our cheese counters are usually bigger than in UK, there is a wide variety of… Emmental and Edam cheeses, that is, there’s no variety to talk of apart from going into the foodstuff department of a big department store like Stockmann or Sokos. What we *DO* have though is a huge variety of soft, fresh cheeses and cheeselike products. Finnish fresh cheeses take a good portion of the cheese section at my grocery store. While the shop does have Philadelphia, the most well known fresh cheese globally, the other brands take out the majority of the shelf. There’s a fresh cheese flavours of everyone’s preference: dill, blackpepper-dill, smoked salmon, roasted tomato, garlic, horseradish, chili, salami, herb mix, peppermix, shrimp, cheddar, chevre, rucola, chives, vanilla, orange, lemon… and plain. (I use orange/lemon fresh cheese to fill a swiss roll, btw. Perhaps I should blog about that later!) This time I picked two flavours, garlic and chives, but ended up using only about half of the garlic one, about 100g. The last but by no means the least important ingredient is bacon. Streaky, thinly sliced, “smoked” bacon is the normal one sold here and it’s also what fits best for this dish. I bought two packages of bacon, each 140g, since I knew I’d be extremely lucky if I get full ten slices in a package. The actual preparing I think is super fun 🙂 Several years ago my then boyfriend and I needed a mixer, and I decided to buy the most expensive one I found in the store, Braun MultiMix M 880, mainly because of the accessories of it were so good. It includes an onion chopper and immersion blender (and a beaker for it) extensions and I love it so much. There’s rarely a week that I don’t use it. And this recipe calls out for the onion chopper extension – I’m not too interested in chopping onion and mushroom to atoms if I can avoid it! So, first I start with cleaning the mushrooms of any dirt, if there’s any on them, with a dry cloth or paper towel. I gently snap the stalks of the mushrooms off, and put them in the onion chopper together with the onions. Few whirs with the machine until everything is nice and small, then I mixed in half a package of the garlic cheese. If you don’t have these fancy pancy flavoured cheeses in your store, then get plain and mix your own flavourings in it! Spoon the mixture in the mushrooms, about a teaspoonful in each, and fill heaped. 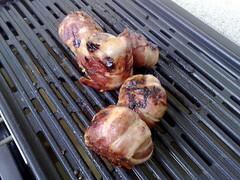 Then wrap the streaky bacon around the mushrooms, and try to cover all the cheese you possibly can with the bacon. At this point you can wrap a cling film over a plate of prepared mushrooms and put them in the fridge to wait for the BBQ, like I did. Prepare them for eating at latest the next day, though! The reason why the bacon needs to cover as much of the cheese as possible is because it seals it in the mushroom when cooking them on the BBQ. The proteins shrink and close the cheese in, preventing it to dribble on the gridle when turned and pushed around. The cheese inside gives the mushroom a wonderful taste, keeps them moist and acts as a sauce.